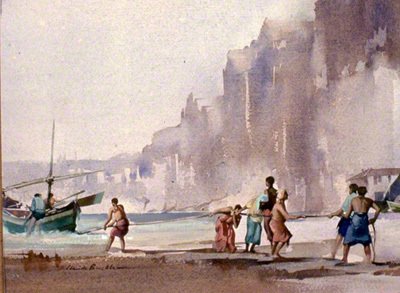 This water colour by Claude Buckle shows a group of fisherman, nine in all, hauling a large fishing boat up onto the beach. The shoreline cliffs and a village are also visible in the background of the picture. The artwork and grouping of the people is particularly carefully done. Mysteriously there is a figure who appears to be just watching on the other side of hauling line. Created in 1968.